As artists, we undeniably use other people’s work to stoke the creative fires inside our own imaginations. Whether it’s re-making a photo that has been done before, taking pieces from multiple works and mashing them together into something of your own or just using it as motivation to move in a different direction, it’s all the same – you’re drawing inspiration from other artists’ efforts. I recently did some of the above, drawing on two excellent photos from the past, and transforming them into something of my own. 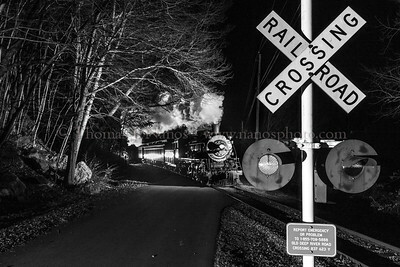 As you probably know, my passion of late has been centered around railroad photography after dark (here’s a post about my thoughts on night shooting), and I usually have a dozen or so ideas floating around in my head at any given time. In the summer of 2015 we visited a friend in North Carolina, and on our way back home we stopped at the O. Winston Link Museum in Roanoke, Virginia – and of course some of those ideas were rattling around my brain. While viewing the collection in the museum, one photo in particular stuck out to me – “Luray Crossing, Virginia 1955”. This photo features a steam train approaching a grade crossing, but the most predominant in the photo is the crossing signal and not the train. 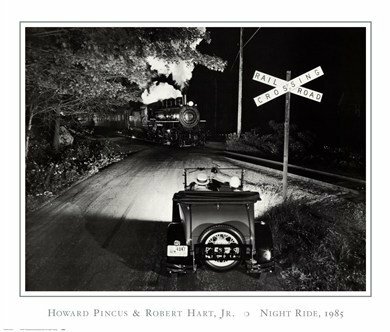 At some point during the summer, I found myself flipping through the pages of Starlight on the Rails – which incidentally was the first book I purchased around nighttime railroad photography. There was one photo that caught my attention – one I had viewed many times before, and one that was taken on the Valley Railroad. This one, made by Howard Pincus and Robert Hart, Jr., was titled “Night Ride, 1985” and was made at the Old Deep River Road crossing in Centerbrook – a location I am very familiar with. Then the proverbial light went on over my head – I thought about combining Link’s Luray composition, featuring a prominent set of crossbucks and flashers, with the location in the Pincus/Hart photo. Drawing inspiration from two photos, and putting my own twist on it. Here is the final result – I think it is quite different than the two I’m drawing inspiration from, but I also feel you can see where I’m pulling the ideas from. I’d love to hear what you think…and of course, if you click my photo above, you can purchase prints of this – as well as a whole slew of other photos. As always, your work is the best.